I have been keeping track of Yahoo's projected points. 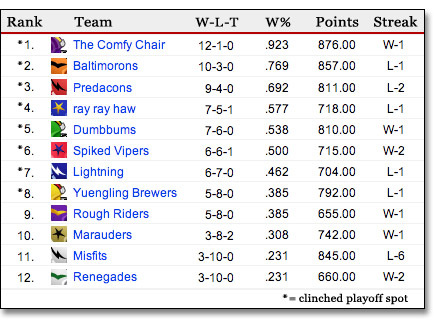 Here are the final regular season standings if those projections held. Be warned, some of these are frustrating. The Misfits Organization would like to thank the Lightning for their alternate statistical interpretation of the season. And we are honored to win the first ever "Unluckiest Team" title in 3FL history. Our team hopes to maintain that winning spirit throughout the off-season and into the 2007 campaign.